Have you heard the cry from the crowd that the Facebook Sky is Falling! Or maybe you've heard that organic reach is dead, there's no way to crack the Fb Code! On our Facebook Business page ww.fb.com/thepreparedperformer and many of our clients and friends pages, we have noticed quite the opposite! I'm going to share all the secrets with you right here. This plan is the secret I've used to increase our organic reach during the recent “DARK DAYS” of Facebook. I'll be sharing other pages who are seeing an increase as well! This isn't a fluke, there's a strategy and it's duplicatable! Jump in! So first, when it comes to Facebook changes, recognize… this will pass. AND THEN, it will probably happen again! Haha! And, Remember WE DON’T OWN FACEBOOK. It’s never been more important to really dive in and engage, connect, be HUMAN. There are LOADS of rules in the FB Terms of Service. As someone who is using this platform as a way to build your business, it is YOUR responsibility to jump in and READ these rules. And then, it is up to you to decide how you are going to follow them. There are LOADS of interpretations that fall all over the map. And, as we saw with the recent Senate and Congress hearings in the US, most people have no idea what the TOS actually mean. All we can do is do our best to follow the rules, and stay genuine, and authentic. Also, keep in mind, even though some of the rules feel limiting, they are actually here for the better interst of all of us. If everyone was allowed to promote all over the place and be super spammy, it would ruin it for all of us. Just because you think that you have an amazing product, that doesn’t mean that everyone wants to hear about it all the time. We’ve had some members in our community hear about the rules and get defensive or think, what on earth is the point if I can’t message my list about my products every single day. Honestly, most of these rules make us better marketers. They will allow us to be more creative and bring in even better results. So, what can you do to get through this time? Let’s dive in!! KNOW YOUR IDEAL CLENT. LIKE, INSIDE AND OUT. I shouldn’t have to go deep into this – because we talk about it ALL THE TIME. But, still, there’s major resistance around it. NICHE DOWN. SPEAK TO ONE PERSON. It’s the only way to really make this work. You can move to a wider audience later. TRUST ME. And watch this video if you still need help. GIVE THEM A REASON TO ENGAGE. Seriously, I’m so tired of hearing people say… no one is commenting on or engaging with my posts when, for the most part there’s no reason for people to engage. Now, what kind of reasons could we give our audience to engage? Here are a few examples of content that converts into engagement, and then I’m going to show you strategies that will ensure people actually see your awesome content. Follow these rules for content that converts into engagement. 1. Solve their problems. But, you have to know what problems they are experiencing first! 2. Entertain them! Give them a break from the stress or mundain ins and outs of their day. 3. Make them the hero! Allow them to give their oppion or share their expertise. 4. Hear them! By posting content that speaks specifically to their emotional experience, they will know that they are understood. 5. Inspire them. Once you listen, specifically show them what is possible! 6. Give things away! It’s often better than an ad spend! 7. Bonus tip – use outside links in a very limited fashion. Facebook doesn’t want you to send people off of Facebook. They want you to increase the time each person stays on their platform. Ok, you may be thinking, that’s great, but how do I actually get people to see this magical content that I have created. We have tested a new strategyon my page and a few of our clients page that is SERIOUSLY working. Here’s the ingredients. A juciy Giveaway + an Ad + multiple ways to enter the ad. Now, remember, Facebook changes the dang rules all the time, so be sure to read over the rules for Giveaways before you launch this! So often, people will give away a free coaching session, or an entry level product that is tied to a “free session.” Ya’ll, our audiences are SAVVY!!! If that session is really going to lead them to a conversation with the intention that you’ll be making an offer, you have to be really careful. Some people will want to talk to you no matter what, but others will know it’s really a sales conversation and they will not want to enter to win. We have seen the best success with giving away physical products. If you missed our Smart Birdy Suitcase Giveaway, you are in for a treat. Here’s a link to go watch the whole crazy process unfold. It 100% transformed the engagement on our business page. Some might be confused about why on earth we’d be giving away a suitcase, so I want give you a little insight into why this product was the PERFECT THING to give away. The “cliff notes” version is this. I bought a really fancy amazing suitcase as my first “big” gift to myself after working my booty for for years building my business. I messaged the company and they said they’d replace it. They sent me a new suitcase and I did an “unboxing video” on my personal page only to reveal that the new suitcase was missing a handle. (Like, the one that had broken, was not even there.) It was pretty hilarious. I messaged them again, they profusely appologiezed and sent another suitcase. I did another unboxing. The 2nd replacement had the wrong color metal, which was actually just a super weird mix up. I messaged them and they offered to replace it again! As this was happening, I was sharing the whole story on my personal page. The reaction was unexpected and awesome. The suitcase was surprisingly a fantastic way to celebrate our values. It brings joy everywhere it goes because of it’s beautiful design, it represents adventure, and it was the first thing I had purchased as a reward for my committment and hustle. And, my reaction to the whole debacle provided a great way stand for kindness because I stayed positive, found more humor in the whole thing, rather then going off or being angry. After realizing how the story had allowed me to tap into our brand values, and provide an awesome source of entertainment and value, I asked if I could use the suitcase that was the wrong color as a giveaway. They said yes! I realize, this was a crazy awesome giveaway, that might not fall out of the sky everyday. AND, there are things that you can use that represent your values, and fulfill a need for your audience. Get creative! Listen! We have used product, tools, someone else's program, so many things with out clients. There are endless possibilities. START THIS PROCESS SOMEWHERE YOU ALREADY HAVE ENGAGEMENT. As you can see with the suitcase post, I started the whole thing on my personal page. Now, I was NOT doing business on my personal page with those unboxing videos. I just thought it was fun to show something that was happening in my life. Once it picked up, I realized I could take that engagement and bring it to my business. Some examples of places where you can start this process are… on your personal page, in your group, on Instagram, at a PTA meeting, heck on the PHONE. (If you have a small following online, know that you can easily reach out to people individually about this.) Most of the time, when people tell me they don’t have a community to start with, after a few minutes of discussion, we find the community. And, if you really don’t have anyone – stop reading this and go look up your local eWomenNetwork chapter. Go find a facebook group of like minded people and make some connections – because, seriously – that is more important than ANYTHING. USE MULTIPLE POINTS OF ENGAGEMENT ON YOUR BUSINESS PAGE AS THE WAY TO ENTER THE GIVEAWAY. Keep in mind – YOU CAN NOT REQUIRE PEOPLE TO TAG OR SHARE IN ORDER TO ENTER. This is written in the TOS as clear as day, and yet, people do it all the time. It’s super risky. Be sure to say – your contest is not in any way connected to Facebook. (I forgot to do that one, and I'm going to add it to every giveaway going forward.) ALSO, I’ve heard some people warn that you can’t do giveaways that go through a messenger bot. I’m personally not convinced this is actually true, cause I can’t find anywhere in the TOS that says that… but be sure to do you or own research. The good news, when I did this, I did NOT do it with a bot, so it doesn't matter anyway! Haha! By doing this, actual magic happened. People were excited looking forward to every post on our page. Now, I get that they were hoping to find the contest. Obviously – AND – I made sure to follow the rules for content that converts into engagement that I listed above. I had people messaging me and telling me that they were refreshing my page all day long. But still, this many comments on our biz page on a little post like this would have NEVER happened before I did the suitcase giveaway. And, then… you'll need to actually announce the winner. The best part! Here was the other super cool piece. We announced the winner inside our private fb group. Which meant, if the winner wanted to know they won – they had to join our community. Helloooooo! It keeps getting better. I will say, this part took me way too long. Because I didn’t use a third party tool to collect the entries, and I wanted to make sure I was being super fair, I had to copy and past each name into a spreadsheet. TOTAL PAIN IN THE BOOTY. So, next time – I’ll be using 22 Social and a slightly different format. Another bonus of 22 Social is that it allows you to reward your audience for shares without breaching the FB TOS. So you follow all of these steps, you do a giveaway that speaks to the soul of your community, then what do you do? 1st, plan content that is really targeted and valuable! You have loads of people who are now tuned in. Don’t let them down! Close your eyes and think – what is on their mind when they first wake up in the morning? THAT is the problem you should solve. Once you’ve built and nourished this relationship, graciously offer the opportunity to get more support, or to purchase a product. 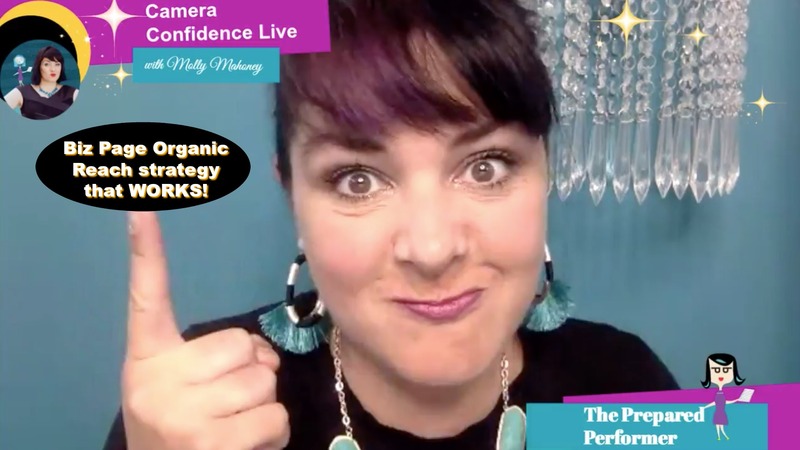 You can do this with a live sale, an album sale, via a strategy session, at the end of a webinar, or sooo many other options. We have several clients who are doing this on repeat, they have a monthly giveaway and their audience keeps coming back for more. You want to be careful about training people to think you are only giving things away, so think about mixing up the prizes, do something to create scarcity and urgency with the products and services you sell. Save some things that you NEVER give away. For example, we used to give away support calls as a bonus. But, we seriously didn’t have enough time. So, we put a cold stop to it. The only way you can get on a call with me or a member of my team at the moment, is to see if we are a good fit to work together (20 Minute call), if you are a new member in one of our Camera Confidence program (20 Minute Orientation Call), or if you are a member of our highest level of coaching programs. If we ever open the giveaway call again – dude. It’ll be bananas. Are you ready to put this into action? If you are interested in using 22 Social, for your giveaway, check out this free masterclass. AND, if you need a little extra support in creating that content that converts, we have an awesome mini course that will help you to make sure your content is primed and ready when you implement this plan. Want access – check it out here! I can’t wait to hear about how this giveaway works for you!! Thaaaaank you Shawn! Great to see you on BeLive today too! Thank you!!! It’s all updated now. I’m not sure if you heard me mention that it wasn’t actually finished yet. Ha! I think I added everything. If you find any others that are missing, let me know! Such great info! Where can we find the 22 social masterclass? I checked out their website but it was a little overwhelming.